Swarna Fasteners is a prominent Manufacturer, Exporter and Supplier of Industrial Fasteners. Our range of Industrial Fasteners includes Industrial Bolts, Industrial Nuts, Industrial Screws, Industrial Washers, Threaded Rods, High Tensile Fasteners and Stainless Steel Fasteners. Our Industrial Fasteners are manufactured with extreme precision and high quality raw material under the supervision of our experts. Our Industrial Fasteners are widely appreciated and used in various industrial applications for the optimum functionality they provide. 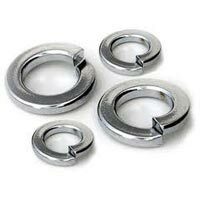 Our expertise lies in making available an assorted range of Spring Washers. Our Spring Washers are manufactured with superior quality material and are widely used in various industrial applications. We are capable off offering our Spring Washers in a customized manner as per the clientâ��s specification at the marketâ��s leading price.